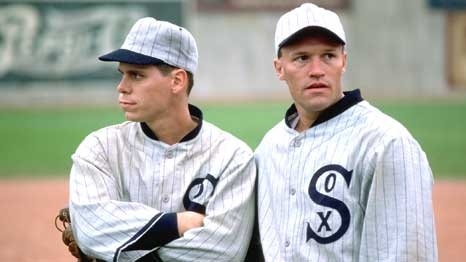 The story of the 1919 Black Sox, Eight Men Out is a tale of greed and corruption eating away at all that is good in sports. Director and writer John Sayles recreates with considerable flair the world of baseball in the early 20th century, and an ensemble cast has fun portraying the heroes and villains of the sportsworld in more innocent times. The 1919 baseball season is drawing to a close, and the Chicago White Sox are the dominant team in the league, and considered to be one of the best teams ever assembled. Featuring the likes of pitcher Eddie Cicotte (David Straithairn), "Shoeless" Joe Jackson (D.B. Sweeney) and shortstop Buck Weaver (John Cusack), and coached by Kid Gleason (John Mahoney), the White Sox are expected to easily win the World Series against the Cincinnati Reds. But the White Sox players are unhappy with team owner Charles Comiskey (Clifton James): he is tight-fisted and less than generous with perks and bonuses. Resentment festers, and it is ripe for exploitation by unscrupulous criminals looking to make a killing by betting against the Sox. New York's shadowy master gambler Arnold Rothstein (Michael Lerner) is finally convinced that several players are open to a cash payout in exchange for losing, and he organizes the fix through intermediaries. Players such as Chick Gandil, Swede Risberg and Lefty Williams eagerly go along with the plan and recruit several other Sox. Cicotte is at first hesitant but later joins in, while Jackson goes along but can't read or write, and is unsure what he is agreeing to. Weaver is approached to join the fix but refuses to participate, although he also doesn't alert anyone that trouble is brewing. Gleason can sense that something is wrong with his team, but has no evidence of wrongdoing. Chicago perform poorly and lose the World Series; the players eventually face the consequences, in the court of law, the court of public opinion, and the court of baseball's newly appointed commissioner. 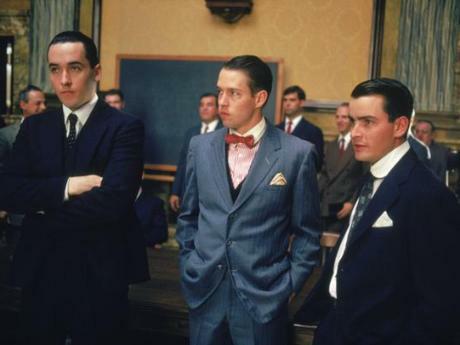 With no single character or actor dominating Eight Men Out, it is David Straithairn's Eddie Cicotte who best represents the mind space of underpaid athletes unable to resist a cash injection worth more than a season's wages to throw a few games. Straithairn portrays Cicotte as never enthusiastic about the fix, but upset enough about his treatment by team owner Charles Comiskey that he is eventually willing to forgo glory for cash. John Cusack as Buck Weaver is also memorable, a man who rejected the cash and played for the glory of winning, but paid with his career for not bringing the fix to light when he had the opportunity. Charlie Sheen in a small role as player Happy Felsch and Christopher Lloyd as colourful moneyman Bill Burns animate the supporting cast. Sayles' writing is sharp, the dialogue filled with zingers and deft jibes as reporters, ball players, gamblers, and shadowy criminals circle each other looking for a story, an edge, or a payday. But Sayles' exceptional achievement in bringing the story to film is his embrace of uncertainty. There are numerous legends and various versions of the truth that swirl around events such as a fixed World Series, and Sayles avoids the temptation of tidying up all the factoids. While Eight Men Out does sometime meander to the outskirts of what appears relevant, the film is brave enough to capture a story without nailing down every last detail. Hence, the film suggests that the players were unsure if they were throwing a few games or the whole series; Shoeless Joe Jackson, portrayed as quite dim, never seems aware of what he is getting himself into, and appears to play hard despite accepting the cash. Several layers of corrupt money men were involved, from masterminds like Rothstein to local goons, and the dots between them are not cleanly connected; and the players never received all of what they were promised, yet were intimidated enough to continue with the fix, or ironically bound by the code of wanting to finish what they started. With elite athletes in all sports arenas still on the lookout for illicit methods to get rich almost a hundred years after the Black Sox scandal, Eight Men Out is a sad reminder that the lure of the dollar for personal gain has always been the most corrupting force in professional sports.